When the sky turns black, why do I feel so blue? The opening title sequence for Michael Arias’ masterpiece, Tekkonkinkreet (the alternative US title), spans an incredible period of more than ten minutes between the start of the film and Arias’ director credit, ultimately pushing the possibilities of the form. There is a saturation of confusion and survival pushing the madness and grime and blind exhilaration. The sequence is a perfect measure of the film itself, a blood and sweat tale of two street children in a multi-canopied city of hallucinatory proportion. But the runtime exceeds some prudish rule we feel the need to uphold, so please consider this clip a small selection and find the full sequence and film for yourself. This opening scene used 500 hand-drawn illustrations and the team spent two months experimenting with the many options. 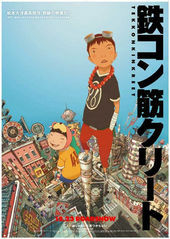 The first minute-and-a-half was not in Taiyo Matsumoto's original Manga, Tekkon Kinkreet. This [beginning] sets the tone...the shot [of the raven's flight] is the first thing we actually executed. I thought we'd take the hardest shot first and figure how far we could take it and that would set the pace for the rest of the production. I would send them our rushes to keep them in the loop. I haven't heard of too many animated films where there's been any music completed during the actual production of the film. It was one of those art school ideas of having the actual production of the music be a metaphor for something that's happening in the story itself – the old world giving way to the new world. I was feeling like [Plaid's music] had that in it.